Vegetarian Slaw wraps | Robert Mitchell Jr.
I’m a big van of the humble collard. 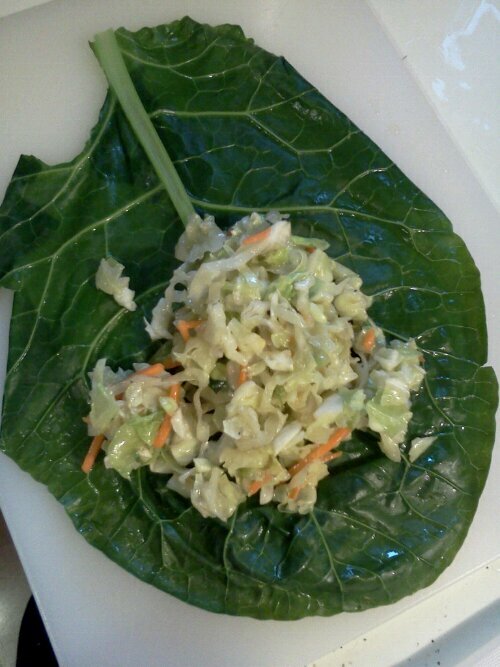 For a low carb wrap, how do you beat a collard leaf? They’re big, don’t tear too easily, have great flavor, and they’re packed with vitamins, minerals, and fiber. Although they can be used raw, I have found that steaming them first gives them a softer texture and a nicer flavor. Here’s how the process breaks down. Buy a small bunch of organic collards. Select the bunch that has the biggest, most perfect leaves. Put about 1/2″ of water in a big pot and put it on the stove on HIGH. Wash your collards while you’re waiting for it to boil. When the water’s rolling, lay the leaves in the pot and put on the lid. Leave them in for two minutes. After two minutes, remove from heat and run cold tap water into the pot to stop the cooking action. Remove the leaves and spread them flat on clean dishcloths. Pat dry and let them rest while you make your slaw. Almost ready to wrap up. This one isn’t Asian-styled — it contains gold ‘ol southern-styled slaw. That’s another option. Experiment. You can buy a prepared Asian slaw mix (there’s a nice organic one in the produce section where I shop) or make some from scratch. Shred your cabbage and soak it in a bath of water with a teaspoon of salt for one hour. Drain. Add a sprinkle of sesame oil (careful — a little bit goes a LONG way) and a splash of soy sauce. Careful not to make the slaw too wet. Add a sprinkle of red pepper flakes. 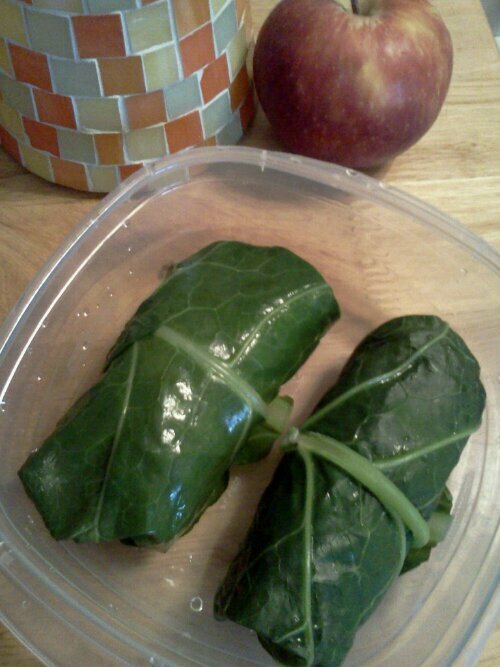 Put a dollop in the middle of each collard leaf, then wrap ‘n’ roll. Put them in the fridge to chill. Serve cold. This entry was posted in Green, Martial arts, Writing and tagged 4HB, collards, recipes. Bookmark the permalink.